For sincere Christians who know that the Bible never banned polygamy, this Independence Day, 2009, is cause for double celebration. 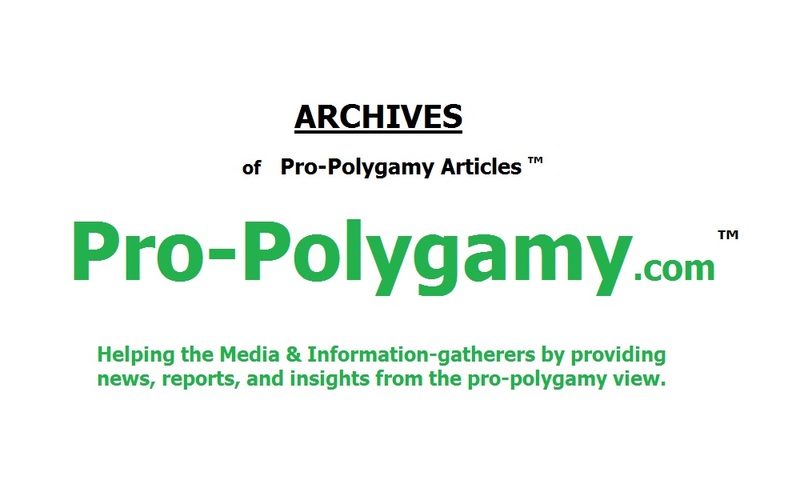 Their new movement, called, Christian Polygamy, is 15 years old today. 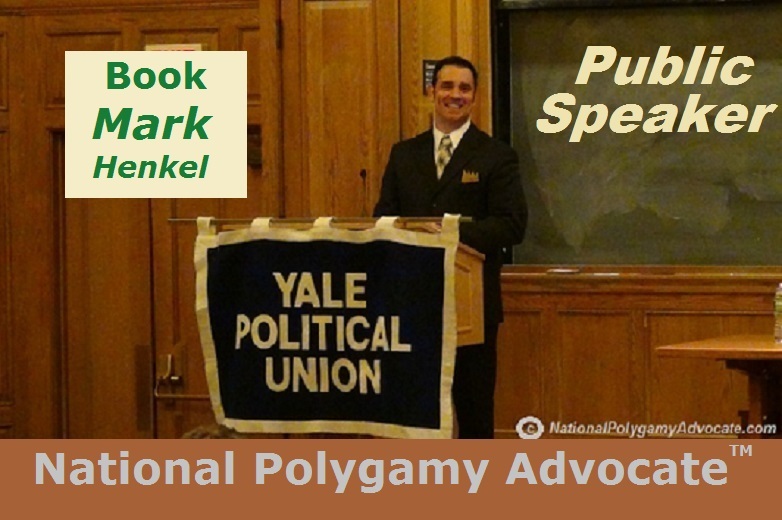 Quoting Mark Henkel, founder of the Christian Polygamy organization, TruthBearer.org, "Polygamous marriage dates as far back as the Biblical book of Genesis - written by polygamist Moses. Christian Polygamy generally involves Bible-studying Christians from any denomination. We have no similarity and no history with Mormonism whatsoever, whether mainstream 'Institutional' Latter Day Saints (my term, 'ILDS') or Fundamentalist Latter Day Saints (FLDS). Rather, Christian Polygamists simply believe that the Bible is true, that it never prohibited polygamy, and that husbands should have a deep compassion, maturity, and emotional intimacy for loving wives as selflessly as Christ loves the churches." Fifteen years ago, on July 4, 1994, Henkel published the first issue of the Maine conservative Christian newspaper, The Standard Bearer. As the publication continued, the essential argumentations were established, proving that polygyny is Biblically valid. A new movement, Christian Polygamy, was born. Other Christians quickly caught on to those powerful arguments. Over the next three years, those argumentations spread to a new communication method called "the internet." The global website, TruthBearer (and eventually TruthBearer.org), replaced the printed Maine newspaper. As the internet grew in the mid-1990s, so grew the website. Numerous Christians around the world were no longer alone seeing the overwhelming scriptural basis of Christian Polygamy. TruthBearer.org quickly became a cross-denominational organization of activists, promoting its long-term mission of bringing Christian Polygamy to the churches. This is not a new religion or denomination. It is simply "Continuing the Reformation" for all "sola scriptura" Christian denominations. Five years into the young new movement, the TruthBearer.org organization’s founder, Mark Henkel, saw that women absolutely had to be protected from cleverly evil men misrepresenting Christian Polygamy. On July 13, 1999, an official standard of Christian Polygamy - called Love-not-Force - was established. That standard protects women from egotistical polygamist-wannabes (now identified as "force polygamists") who, instead of loving their wives, would selfishly force polygamy against a wife's un-coerced acceptance. With Love-not-Force, never again would any "force polygamist" be allowed to undermine the genuine pro-woman focus of true Christian Polygamy. Genuine Christians in the movement wholeheartedly rejoiced and embraced Love-not-Force. Not surprisingly, the small number of "force polygamists" adamantly opposed it. But the true Christians moved on without them, rejecting all of such foolishness, although offering ministry and counsel to anyone wounded by it. Being so ignored by the actual Christian Polygamy movement and therefore off on their own, most "force polygamists" would understandably lose their wives. One man, an ex-convict who bragged about his "force polygamy" as he absurdly tried to build a cult around himself in Utah, ran off to Texas with one of his later wives and utterly abandoned the rest of his wives and children. One of the few friends left behind by the runaway ex-convict was another self-absorbed "force polygamist" who later murdered his own second wife, maliciously carving up her face and body with a knife. Undeniably, the antichristian misogyny of "force polygamy" starts with profound callousness of heart toward women and only leads to family destruction, abandonment, and even murder. It is no wonder that genuine Christians in the actual Christian Polygamy movement instantly rejoiced to have the Love-not-Force standard in place against such self-evident evil. If a would-be polygamist does not meet the Love-not-Force standard, then the situation is just not true Christian Polygamy in the first place. Consequently, any currently professed opposition against the Love-not-Force standard now immediately self-identifies such an opponent as an obvious "force polygamist" who is not legitimately part of the true movement anyway. "Force polygamy" simply has no place in true Christian Polygamy. Subsequently, Love-not-Force became so important that it was then generalized as the standard for the overall national polygamy rights movement for consenting adults - no longer limited only to Christian Polygamy. Normal consenting adult pro-polygamists of any variety or religion likewise would not have to be tainted by the cruelty of "force polygamists" either. "Force polygamy" simply has no place among normal consenting adult pro-polygamists in general. As such, by clearly disavowing and discrediting all "force polygamy," the standard of Love-not-Force had blossomed into a powerful pre-emptive strike against dishonest media. 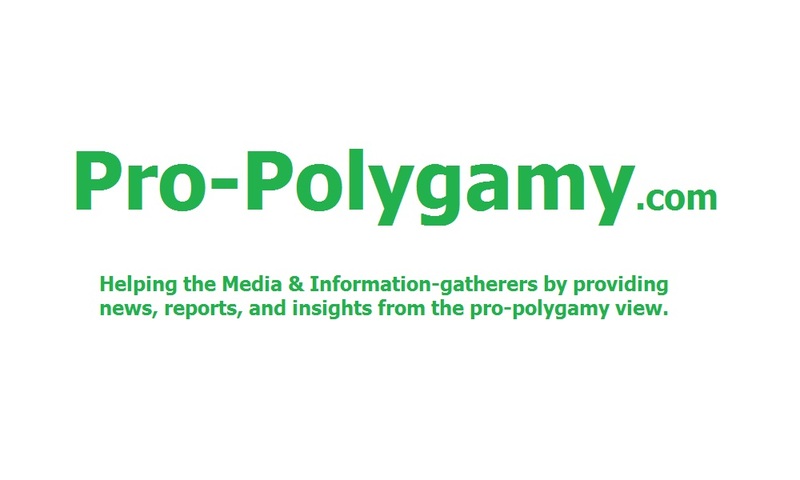 Namely, whenever any "force polygamist" is used in a media report as a supposed "example" of polygamy, Love-not-Force now discredits the report as intentionally dishonest media propaganda. With Love-not-Force in place, Mark Henkel quickly started receiving numerous media requests for interviews by the year 2000. As the number of interviews and media reports grew, it also elevated Henkel to the larger role as the National Polygamy Advocate for the overall national polygamy rights movement for consenting adults in general. Henkel's unique non-Mormon, non-lascivious, pro-woman, Christian position enabled him to successfully persuade even anti-polygamous conservatives and Christians - unlike anyone else from other religions or backgrounds. In 2005, Pat Robertson’s "700 Club" interviewed Mark Henkel and then identified him and Christian Polygamists as "evangelical Christians." In 2006, Newsweek and the Associated Press reported about Henkel, TruthBearer.org, and the movement. By 2007, numerous other media had followed suit. In 2008, John Stossel did a "Special Report" on ABC's "20/20" with an evangelical Christian polygamous family and a Jewish polygamous family, broadcasting a number of Mark Henkel's sound-bites. In 2009, one news service, WorldNetDaily, was even specifically trying to get President Barack Obama to comment about the National Polygamy Advocate, Mark Henkel, by name. In these past 15 years, the Christian Polygamy movement has made significant accomplishments: essential arguments laid down; Love-not-Force standard set; major media attention received; acknowledged as "evangelical Christians;" and realized for making it possible for the overall national polygamy rights movement for consenting adults in general to credibly make its case. In the next 15 years, Christians in all churches might even be thanking Christian Polygamists for their faithfulness. With these successes by their movement's 15th anniversary, Christian Polygamists are excited, doubly celebrating this Independence Day, 2009.